I confess, I have well over twenty portable shortwave radios at the moment…So why am I still so enthusiastic when a new one arrives in the mailbox? My Tecun PL-310ET just arrived, purchased from my favorite eBay seller, Anon-Co . And I just can’t wait to compare the PL-310ET with my PL-380. Perhaps this will become another opportunity for a blind radio comparison by you, our community of listener-readers. Dare I say, a community equally enthusiastic? By the way, I plan to publish the results of our recent weak-signal comparison on Tuesday of next week. I’m still impressed by your responses. But there’s still time to submit your vote. Stay tuned…! This entry was posted in New Products, News, Radios, Shortwave Radio and tagged Anon, Anon-Co, PL-310ET, Tecsun, Tecsun PL-310, Tecsun PL-310ET on April 17, 2014 by Thomas. Has anyone here figured out how to change the memory page on this radio? There is no page button such as what is on the PL-660. There are no pages, just continuous memories. Does anyone here know how to conduct a system reset on this radio? I just got one a couple of days ago and the display/lock button does not work at all. Thanks! when was PL-310ET introduced in the Market? Was it a new model was it introduced in 2013 or 2014..
How does the shortwave reception on this radio compare with the larger and more costly Tecsun Pl-880 and Grundig Satellit 750 receivers? Admitted, I have them all the PL-606, PL-380, the PL-310ET (and a KAITO KA321). The PL-310ET has by far the best/ i.e. most responsive buttons: Soft touch and no double bounce (worst offender for double bounce is the PL-606). The PL-310ET has the best sound. PL-606 is harsh, but good for the hourly news. PL-380 too much bass, not so good for listening to the news. 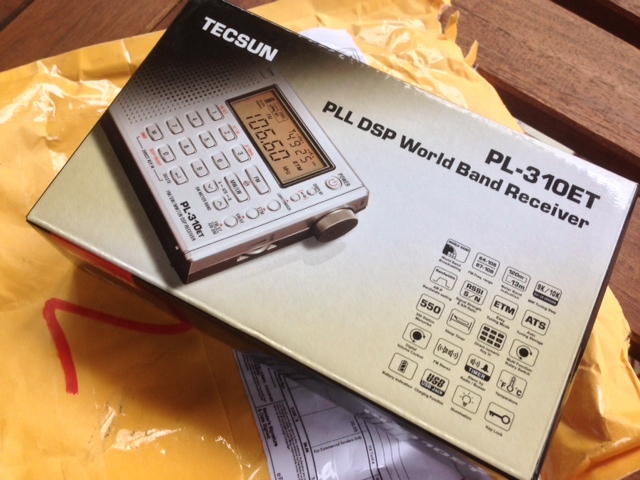 In several months of extensive daily use the PL-310ET did NOT annoy me once with the feared “TECSUN hang-ups”. To explain “hang-ups”: Radio cannot be switched off, cannot be switched on. Some buttons, e.g., the memory button totally unresponsive. The PL-380 MEMORY button drove me crazy: I could not change the station which would wake me up with the ALARM function. More examples of TECSUN “hang-ups”: When turning the frequency wheel there is on the PL-606 often (and also often on the PL-380) a “haphazard frequency selection”. I.e. the frequency goes “up” when you wanted “down”. The same for the PL-606 and PL-380 volume wheels. Again, no such problems with PL-310ET in several months of daily use. Q. Why are these “hang-ups” annoying with the PL-606 and PL-380? A. I have to take out the batteries every two to four weeks (for MORE than four hours) for a “re-boot”. My PL-606 and PL-380 radios cannot be used during those four hours needed for the “reboot”. Note: Especially annoying when you want to set the ALARM time in a hotel, when you go to bed and it is past midnight. Only ownership complaint re the PL-310ET: Here in SW Florida almost no SW reception. And yes, the customs papers from Hong Kong stated: Custom’s Value of the PL-310ET is US$9.- I fear this is indeed the whole-sale price in China? $9 on the customs declaration is just a low value to avoid import taxes, PL-310ET cost $32 and up in China. (I know the post is one year old but people still read it). I agree with ALL your comments. VERY Useful indeed! The memory button issues for the PL-380 were so bad I threw the radio out (gift to the Good Will boys). PL-380 MUCH less sensitive on AM than the 310ET. PL-606 has even worse buttons (sometimes I could not switch it “on” or “off”. PL-606 in comparison to the 310ET much better for Newscast-Audio than 310ET (310ET has low pitch, good for ‘music’ but not ‘voice’. PL-606 much more sensitive than PL-380. Does it have the heavy soft mute of the PL-310, or the lighter soft mute of the PL-380? I wish Tecsun would allow soft mute to be switched off if desired. I’m guessing toward the heavier side. I’ll need to get my PL-380 and compare side-by-side. I, too, wish they had an option to defeat this. Makes for fatiguing band scanning. Does the PL-310ET have the ability to disable the intelligent lighting like the PL-310 and PL-660 do? On those radios pressing the 5 button with the radio off gives access to a manual light mode – in that mode the backlight never comes on unless you press the LIGHT button. How is the sound on FM from the speaker compared to the PL-660? The info says “USB 5V/250mA external adapter (not included)” What does that mean? Does it mean you have to get something extra to charge it from a USB connection on your PC, say? from an AC outlet? Which one? Are such adapaters available? I will check these as I evaluate the PL-310ET! Thomas, any update on the 310ET review and comparison with 380? Thanks! Thomas did you happen to compare PL-380 with PL-310 ET. I googled for comparison but i dont get very good idea about which one to go for. I own a PL-660 but its not ultra portable like my KA321 which is far less than 660.